We believe that comprehensive tax reform is uncertain at present, due to a number of other priorities facing the current Administration. There are some significant differences between the plans proffered by the White House and the House of Representatives, which may end in a compromise between the two plans. Based upon our view of the recent developments, we believe that that a compromise bill is fairly likely to be passed during the first quarter of 2018, and that it will likely lower top individual and corporate tax rates. However, we fear that the various compromises we believe will most likely be necessary to move the process forward – including the possibility, which we think is a likelihood, of combining tax reform with infrastructure investments, will mean that we are unlikely to see the truly comprehensive tax reform we believe the national system of taxation requires. While we believe that the tax system badly needs comprehensive reform, it is our strong belief that this is not, nor should it be, an easy or a quick process. To effectively reform the U.S. tax system, in-depth studies and thorough analyses of the existing data are required, and should not be rushed. A well-thought-out, thorough, truly comprehensive bill would be far better than a hastily-cobbled, corner-cutting measure. We await further details of the Administration’s proposal for tax reform. We believe more specifics should be forthcoming from Treasury Secretary Steven Mnuchin, hopefully in the near future. The House of Representatives’ proposals for tax reform also need more specificity, and debates are on-going, although the “Republican Blueprint,” originally released on June 24, 2016, is the basis for the House’s main alternative to the Administration’s proposal. Speaker of the House Paul Ryan said yesterday that he hopes that a comprehensive tax reform bill will reach the President’s desk before the December 23, 2017, Congressional Recess. The Administration and House plans have major areas of general agreement, as well as some differences. One significant sticking point is the Border Adjustment Tax (BAT), on which the Administration has backpedaled its earlier tentative support, while Speaker Ryan has been insistent that it be included. Representative Kevin Brady (R-Texas), who chairs the House Ways and Means Committee, is also supportive of the BAT. Yesterday, Speaker Ryan gave us the news that he can potentially envision tax reform passing without the BAT. The possibility of a BAT has raised concerns among some House Republicans, and it appears that the Senate leans against such a tax. The Administration has acknowledged the appeal of a BAT, which under the House plan would impose a tax on imports. The offset would be that exports and other foreign sales would be made without those sales being subject to the BAT. However, the Administration, as well as some Senators and Representatives from both parties, contend that the BAT, in the form proposed by the House, is not a workable solution, and many businesses which import goods have raised serious concerns as well. This difference in approach appears to be one of several which, at present, put comprehensive tax reform in jeopardy for 2017. 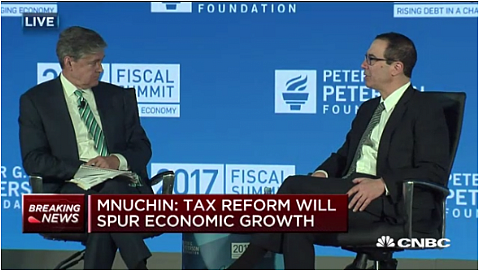 Secretary Mnuchin has said that the Administration’s objective is to have tax reform passed during 2017; however, he acknowledged that this is unlikely to happen by the August Congressional Recess, which previously had been the Administration’s goal. Plans for tax reform are further complicated by the fact that health-care reform, addressing the tax implications of the ACA, has not yet been passed. Although legislation toward addressing these tax implications was passed by the House, the Senate is still working on its own version of health-care reform legislation. As of yesterday, according to an estimate by the Congressional Budget Office, the health-care reform bill approved by the House would result in a potential additional 23 million uninsured, while reducing the deficit by ~$120 billion over the next 10 years. Yet another twist came yesterday, as approximately 40 House Representatives from both sides of the aisle pledged support for bipartisan tax reform efforts, if coupled with infrastructure investments. The “Problem Solvers Caucus” believes that combining the two will draw more bipartisan support for tax reform. • What will tax reform look like? We believe that top tax rates for both corporations and individuals are likely to see significant reductions. • When will it be enacted? Possibly in late 2017, but we believe it is more likely to happen in the first quarter of 2018, although it could be made retroactive to 2017. • How will it affect you? If you are concerned as to how tax reform may affect you and/or your business, and would like to plan ahead, please call us at 504-586-3050.